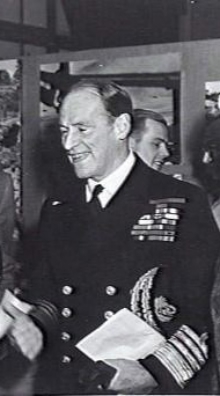 Admiral Edward Ratcliffe Garth Russell Evans, 1st Baron Mountevans of Chelsea. Earlier in his career, he was second in command of the British Antarctic Expedition 1910 (also known as the Terra Nova expedition). He was in command of the Terra Nova from Cardiff to Capetown, where the expedition leader, Capt. Robert F. Scott, caught up with the Terra Nova by fast mail boat. The plan had been for then Lt. Evans to be in command until the ship reached Melbourne, where Capt. Scott would be waiting and then assume command. But having caught up with the Terra Nova early, in Capetown, Capt. Scott assumed command there, thus infringing — or rescinding without cause — previously delegated authority. Lt. Evans hid his feelings, but he nevertheless took this change of plan as a slur, and thus the tension between the two leaders began to take hold and bloom into a serious problem of leadership. For more, see Roland Huntford's history, The Last Place on Earth. Photo obtained from Wikipedia. Delegating is the investing of responsibility and authority from you to your subordinates. It creates reserves for you and gives your subordinates a chance to grow. Too often, though, troubles arise because we don't have a clear understanding of how to delegate effectively. Here are some guidelines you might find helpful. Even though you might have delegated something, you remain accountable for it. Your subordinate is accountable to you, but you are still accountable for whatever you delegated. Sometimes, things don't work out. You might have delegated inappropriately, or your subordinate might fail for some reason. Since you always retain the responsibility to revisit your decision, be prepared to do so, but never rescind without cause. Even if you believe that your delegation decisions were correct, your subordinates control their own levels of passion and commitment. They might agree to accept what you delegate, but unless they're truly committed, delegation can create trouble. When what you delegate is unappealing, there's a temptation to promise something in exchange. If you do promise something, keep that promise. If you can't keep the promise, don't make the promise. In risky situations, emergencies can occur, because when things go wrong, they sometimes go wrong in herds. To create reserves to manage these emergencies, delegate. When you delegate something, delegate it fully. You remain accountable for it, but it's no longer yours. Get out of the way. Delegating the work of a task, and not the authority to determine the manner of accomplishing it, can be demoralizing for the subordinate. This is particularly true of tasks requiring creativity, insight, or commitment. your own accountabilityauthority is demoralizing and creates problems for future delegation. If you feel the need to infringe, but you don't see a need to rescind the delegation, you're probably over the line. Make an agreement that each of you will inform the other as soon as you learn anything that changes the risk profile of whatever you delegated. Your subordinate agrees to alert you when trouble looms, and you agree to tell your subordinate about any enhanced risks. It's a trusting partnership. Since you remain accountable for whatever you delegated, you have a right to reasonable monitoring of progress. Work out with your subordinate a mutually acceptable set of checkpoints, and stick to them, asking for status reporting neither more frequently nor less frequently than you agreed. Would you like to see your comments posted here? rbrenHKUbJVdJyCcYTtJnner@ChacJfrnsBRwNuphDIABoCanyon.comSend me your comments by email, or by Web form. I offer email and telephone coaching at both corporate and individual rates. Contact Rick for details at rbrenDQsZwvPUdCKhzMPIner@ChacXcMLkBvcFcVoPJSQoCanyon.com or (650) 787-6475, or toll-free in the continental US at (866) 378-5470.